In recognition of Endometriosis Awareness Month, Women's Excellence launched a campaign on Endometrial Ablation. In recognition of Endometriosis Awareness Month, Women's Excellence launched a campaign on Endometrial Ablation. About 10 million women suffer from heavy menstrual bleeding. Many women begin to experience heavy and/or irregular bleeding in their 30s and 40s, as they begin to get closer to menopause. NovaSure® endometrial ablation is a quick, safe, and simple procedure to lighten or stop periods, without the side effects of hormones or the risks of hysterectomy. This procedure that can reduce or stop menstrual bleeding and works by removing the endometrium, or the lining of the uterus (the part that causes the bleeding), with a quick delivery of radiofrequency energy. 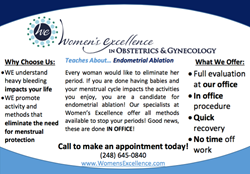 Women’s Excellence is the most comprehensive obstetric and gynecologic office in Michigan. They also specialize in menopause, weight control, bladder control, endometriosis, robotic surgery, pelvic floor physical therapy, and midwifery services. The knowledgeable, well-trained, compassionate physicians and healthcare providers of Women’s Excellence are taking new patients and are conveniently located in four locations throughout southeastern Michigan, Birmingham, Lake Orion, Clarkston and Metamora. For more information, visit http://www.womensexcellence.com.